When you file for divorce, an option to amicably resolve any disputes and reach a resolution is mediation. This is a process where an unbiased third party (i.e. the mediator) assists you, your spouse, and designated counsel in reaching an agreement about your finances, your children, your home, and other assets and liabilities. Here are some important facts you need to know about the mediation process in Houston. A mediator is neutral, meaning they do not take sides. They do not represent you or your spouse. Instead, they focus on helping you reach a fair agreement to get your divorce disputes settled. The people that serve as mediators are typically former judges or experienced lawyers. In order to be a mediator, substantial training and certification are required. Reducing the cost and delays involved in having a court decide the outcome of your divorce. Mediation can only work, and is only advisable, if both you and your spouse agree to participate. Keep in mind, you can can terminate at any time, as can the mediator. The content and process of a mediation is completely confidential. The mediator is prohibited from disclosing information revealed during the mediation. The only exception to this prohibition is if a child’s safety is at risk. 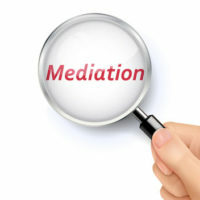 The mediator cannot testify in court nor reveal documents used in the course of the mediation. The confidentiality of mediations is sacrosanct and intended to ensure you can speak candidly during the mediation proceedings. In many cases, a mediation is an all-day event, and there are even some cases requiring a multi-day mediation to resolve all outstanding issues. This is why you should come to the mediation dressed comfortably and be prepared for a full-day of negotiations. If your divorce case settles at mediation, the mediator will record the decisions you and your spouse made in a written agreement. This agreement is a contract between you and your spouse meaning a breach of the agreement carries legal ramifications. Your Houston divorce lawyer will then prepare a Final Decree of Divorce and submit that decree to the court for entry and filing. Once the decree is entered, you are legally divorced. In some cases, the parties simply cannot reach an agreement. If this happens, it means your divorce case proceeds to court to be heard by a judge. In other cases, you may reach agreement on some issues, but leave some issues unsettled to be decided by the court. In either case, after participating in a mediation, you will probably have a clearer idea of what the issues are going forward. The experienced Houston divorce and family law lawyers at Lindamood & Robinson, P.C. are ready to help you through this tough time. If your spouse, or their lawyer, proposes mediation, we can advise you whether it makes sense to go forward and we will be there, by your side, every step of the way. Contact our office today.